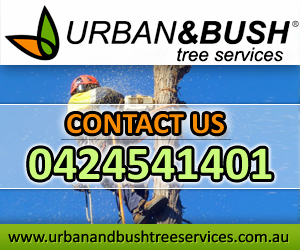 Urban & Bush Tree Services renders all types of tree and garden maintenance for residential and commercial properties. Whenever you need assistance in tree trimming and removal, your friendly arborists from the Urban & Bush Tree Services is here to help you. Contact them on 0424 54# ### today. Urban & Bush Tree Services is a family owned tree service business based in Eurobodalla. The company brings its 5 years of arboriculture experience and education to the property owners in Eurobodalla, Mogo, Moruya and Batemans Bay. With its team of qualified arborists and horticulturists, you can rely on the excellent care and maintenance that only Urban & Bush Tree Services can provide. For overgrown parts of trees that pose risks of injury to you and your property, Urban & Bush Tree Services offers tree lopping at a competitive cost. Its team of arborists will carefully diagnose the extent of the situation, and apply a fitting solution that is in accordance with the applicable laws surrounding tree lopping. Hence, you can put your mind at ease, knowing that all the work performed by the Urban & Bush Tree Services complies with the tree preservation code of the Eurobodalla Shire Council. So at the first sign of potential tree hazard, have it inspected by the experts from Urban & Bush Tree Services. Worrying about the tree stump that's ruining your landscape? Urban & Bush Tree Services has a solution for that! With its revolutionary equipment called the Stump Humper, its team can grind and remove the problem stump in less than an hour! This tree stump removal service is guaranteed to eliminate regrowth, and prepares your property for paving and landscaping. Excavation services are also offered for larger tree stumps and trunks. Aside from stump grinding and tree lopping, Urban & Bush Tree Services also provides other kinds of garden maintenance. Its team of arborists is also trained and well skilled in pruning, mulching and tree removal; while its team of horticulturists offers consultations for mulch, plant and tree selection for your garden. Firewood is also available for delivery, all year round! For more information, call Lauren Clark at 0424 54# ### or visit the website.